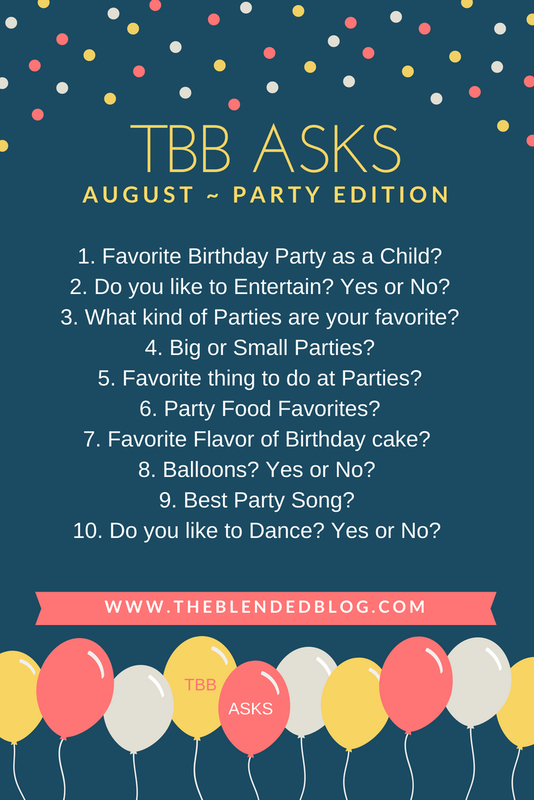 It's the first Monday of a new month and that means it's time for The Blended Blog Asks! This month we're answering all sorts of questions about parties. 1. Favorite Birthday Party as a Child? Hmm.. I'd probably have to say the year my mom and step father offered to take me and a good handful of my friends to Rocky Point. We loaded up two vehicles and spent the day at the park riding rides and it was so much fun!! I'm pretty sure I was in middle school and ridiculously hard to please at that age. 2. Do You Like to Entertain? Yes or No? It depends on my mood. I hosted all family holidays, summer parties, and everything in between for years and years and years until I got sick of all the work. Now I do like to entertain occasionally but we keep things much more casual. 3. 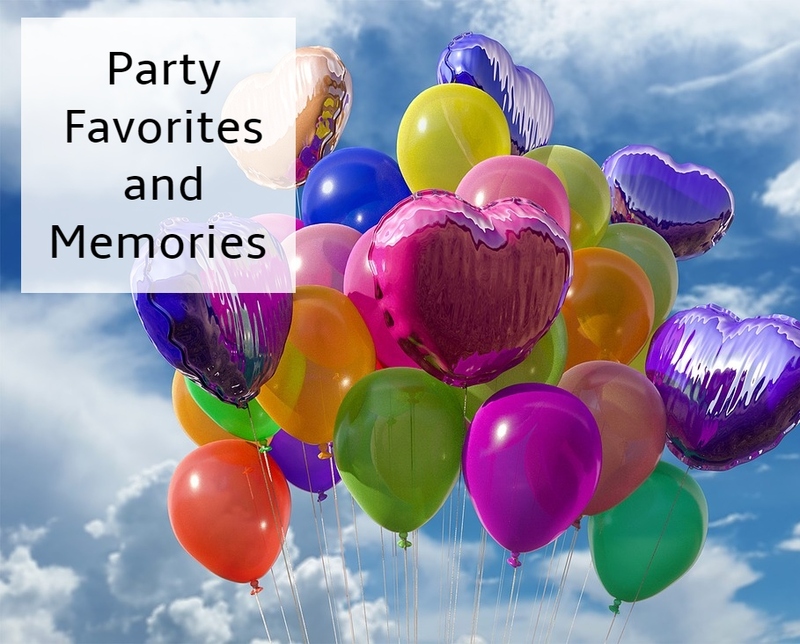 What Kind of Parties are Your Favorite? Cookouts and backyard barbecues are my favorite parties especially at the lake when all the kids can play in the water. 4. Big or Small Parties? Small; I like to have time to interact and talk with people but large parties make me feel overwhelmed and I tend to just stick to my husband's side or find a quiet corner by myself. 5. Favorite Things to Do at Parties? Eat! I am a total unabashed foodie and I just love trying new foods. 6. Party Food Favorites? I don't have one favorite party food but if I'm throwing a birthday party at our house I like to have the food go with whatever theme we picked for the party. I make up cute labels for the food and everything! Check out our Ninja Turtle Party, fishing party, and How to Train Your Dragon Party. Our Ninja turtle party with sewer cookies (Oreo), sewer water (lemonade dyed green), Bo staff pretzels, etc. No fishing party is complete without edible bobbers! Table complete with Viking shield cookies (Oreo), fire balls (cheese balls), Fishleg's goldfish, and dragon poop. 7. Favorite Flavor of Birthday Cake? I always hated cake until a few years ago. My mom often bought Carvel ice cream cakes or made me apple pie or cheesecake for my birthday. Now I seem to like every flavor but if I had to pick I'd say this chocolate/ coffee/ peanut butter cake is my favorite! 8. Balloons? Yes or No? Yes!! I just love decorating with balloons, especially for birthday parties! There again they must match the theme! Yes, we even had a Skylander's party! 9. Best Party Song? Well, you can't have a birthday party without the Happy Birthday Song. However for dancing I prefer songs like the YMCA that make me want to get up and dance. 10. Do You Like to Dance? Yes or No? Yep! In fact I took dance lessons all through high school (not that I ever figured out how to break out any of those tap dancing moves on the dance floor without looking really weird). 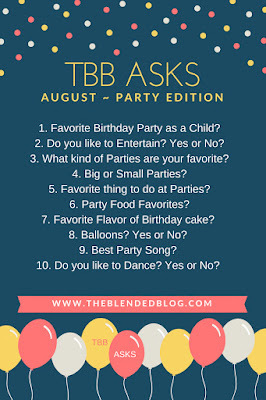 Grab the graphic if you'd like to join us and be sure to link up at The Blended Blog. Backyard BBQs really are great because they're so low key! I think that's why I like them so much. 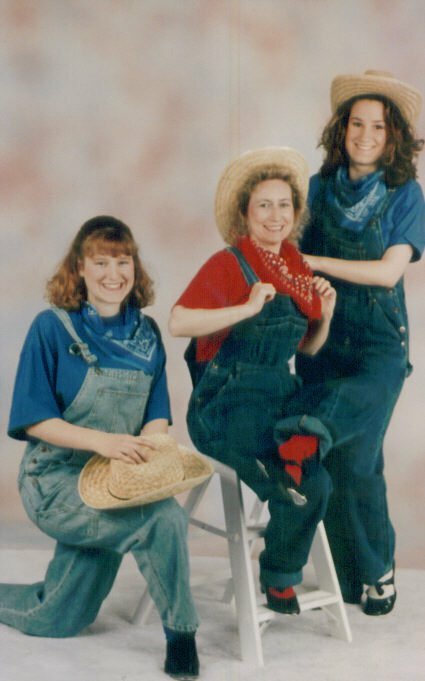 LOVE this so much from your curly hair to your frosting matching your blue top to the dance photo..looking so cute in your overalls! A fishing party theme, how COOL! Thank you. I'm in the midst of planning a shark themed one for this month. Yay!! You and I are definitely “party animals!” Lol! I agree that it’s ALOT of working planning and giving parties and entertaining, but I love it!! When I see everyone smiling and having a good time, it makes me happy! That chocolate birthday cake looks delish!! I think my breaking point was when we hosted xmas eve, xmas brunch, and xmas dinner. Three parties in under 48 hours was brutal. I still host but only occasionally. I love Carvel cakes! We don't have carvel in KS! We no longer have a Carvel store around but thankfully all our local grocery stores carry their cakes. Exactly! Plus I love having an excuse to try a new recipe if I'm the one hosting. The food is one of my favorite parts of parties! It's so fun trying new things. I love small parties so I get a chance to talk with everyone, too. I love having that chance to catch up and if the party is too large (especially if I'm hosting) I'm too busy to get to stop and talk to everyone. Fun post to read! I had to laugh about food being your favorite part - I would have said the same! That chocolate coffee peanut butter cake looks amazing! Must try that chocolate, coffee, and peanut butter cake. It sounds delicious. Also, I prefer smaller parties as well. They feel more inviting and smaller crowds are less intimidating. It was so good! I wasn't sure at first about combining all those flavors together but my son insisted and it was by far one of the best cakes we've made.